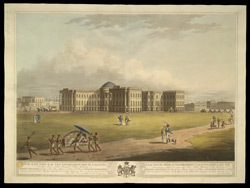 Engraver: Clarke, J & Merke, H.
Aquatint of the new government house in Calcutta, published by Edward Orme in 1805 and part of King George III's Topographical Collection. This is a south east view of the grand building, which was built between 1799-1802 under the aegis of the Marquess of Wellesley (Governor-General 1798-1805). Wellesley was determined to occupy a house suitably befitting his position. Captain Charles Wyatt designed it, using Robert Adam's Kedleston Hall in Derbyshire as his main inspiration. It had a similar classical facade, but modifications were made to accommodate the Calcutta climate as explained by Maria Graham's Journal, 'The four wings are connected with it by circular passages, so long as to secure their enjoying the air all around'. The building of Government House was not universally popular - Wellesley had ordered the destruction of 16 newly built private mansions to create the necessary space and its cost angered the Directors of the East India Company. The artist Moffat shows the shell of the building complete but he does not show the four gateways and railings which must have been added after the picture was drawn. It is now the official residence of the Governor of Bengal, and known as Raj Bhavan.